Age is a key factor when talking about infertility, which is increasing given that the current society is pushing us to delay motherhood to our earlies 40s due to work or economical priorities. Although assisted reproduction techniques can help many women despite their age, it is true that after 42 years old it becomes more difficult. If we decide to delay our motherhood for whatever reason, we must be aware of all the options we have and the risks we can take. A 40-year-old woman is young, still very young, but although we have evolved and our body-mind has adapted, unfortunately our eggs and egg remains the same. Age is the determining factor for oocyte quantity and quality, but other conditions can develop and affect fertility with the increase in age such as genetic diseases, early menopause, having suffered from cancer, bad habits of life, etc. A woman is born with a certain amount of eggs, which is what is known as the ovarian reserve. This reserve will be decreasing throughout life until it reaches exhaustion at menopause. The moment of greater fertility of a woman is 20 to 27 years, although the levels stay optimal until we reach 35 where the quantity and quality of eggs begins to drop abruptly. 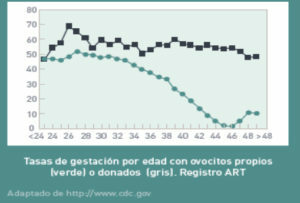 At 40, the monthly probability of a healthy woman’s pregnancy is only 5%, while at 30 it is 20%. We must also keep in mind that the presence of menstruation does not assure us that we will get pregnant. 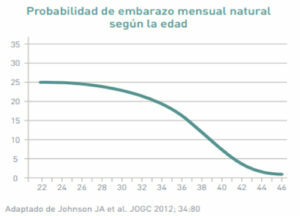 After 45, the probability of getting pregnant is less than 1%. Another key factor to keep in mind is the quality of these eggs or oocytes. The quantity is important but quality is even more important since over the years the eggs accumulate more chromosomal alterations, which makes pregnancy more difficult besides increasing the risk of abortion and the birth of children with genetic diseases. Therefore, the recommendation is to make a Preimplantation Genetic Diagnosis to women who want to perform assisted reproduction treatments with advanced age to prevent recurrent diseases and abortions. Although we can achieve a pregnancy we must be aware that after 40 years of age any pregnancy is risky. A healthy woman, without any disease that affects the uterus can give birth to a baby even if the quality of its eggs is not good. The egg donation allows women without a good quantity or quality to fulfil their dream of becoming mothers. We must take in mind that with age, diseases that have nothing to do with fertility, such as diabetes, hypertension, arthritis, etc., appear. These diseases can condition the pregnancy and therefore the pregnancy can become a risk for both the mother and the future baby therefore pregnancy must be well controlled. Can I know my quantity and quality of eggs? Knowing the quality of the eggs before undergoing fertility treatment is very complicated and there is no evidence for this. There are several tests, although the main tests are the measurement of the antimüllerian hormone or the antral follicle count in an ultrasound review. With these two tests an expert gynecologist in assisted reproduction can give you an idea of your ovarian reserve. What can I do to delay my motherhood? One of the options if we want to become mothers in the future is to cryopreserve your eggs. 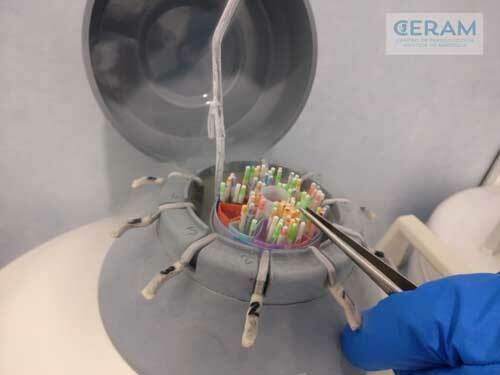 This technique consists in preserving our eggs when they are of good quality, which is before the age of 35 (or ideally, before the age of 30). They are stored in liquid nitrogen tanks and can be used when desired. It is a simple procedure that gives you more peace of mind when waiting for the right time to face motherhood. Each woman must be free to choose when she wants to be a mum, although CERAM we believe it is very important that she has all the information to choose with criteria. Be mother when and how you want and be aware of all your options.